I have suggested, in a previous post here on 2 June 2017—that the story of Jesus ascending to heaven, i.e., floating up to exit Earth’s atmosphere—qualifies as the New Testament’s Biggest Lie. Anyone with the least shred of common sense, knowledge of a rotating, orbiting Earth, and any appreciation for the line between fact and fiction/fantasy, knows that no such thing happened. There are a lot of folks, however, for whom skepticism about received religious tradition never kicks in. Compare this with fantasies about Superman; a six-year old may be awed by the Superman comics/movies, but by age ten, chances are, healthy skepticism has kicked in. And from that age on, Superman is enjoyed—using the term of old friend of mine—as “good schoolboy adventure.” Great fun, Yes. History—well, of course not. But religion seems to be a major holdout in the struggle against fantasy-based thinking; from time immemorial, fantasy has been the preferred genre of religious authors. Is it really fair, however, to accuse them of lying? Sure, we could quibble (if the authors were “sincere,” then it wouldn’t be a lie, right? ), but even without the word “lie,” we can argue that the New Testament authors are guilty of a cover-up. Why is the ascension story a cover-up? If, for the sake of the argument, we grant that Jesus rose from the dead, then the New Testament had to invent a story about what happened to the raised body, to avoid the inconvenient truth that—ascension to heaven not really being an option—Jesus died again, and was buried again. No triumph over the grave. But Christian apologists can respond with irrational contortions when we point out such obvious, egregious flaws in their scriptures. Hence I was not surprised by the response to my post by a Christian whose handle is—wait for it—Realist1234. He seems to be happy wandering in a universe of “alternate facts.” No, Superman can’t leap tall buildings with a single bound, but for Jesus it’s not a problem. Yes, I had heard that A.N. Wilson returned to theism, but does that mean that he also embraced manifestations of Christian silliness? That is, one can come to believe that a god exists without buying the ghoulish superstition that a first century Galilean peasant came back to life (a feat that magically saves us all)…and that he floated up to heaven. Very devout Jewish theists, for example, have no trouble dismissing such tall tales (as they can reject as well the story of Elijah being taken to heaven on a fiery chariot). So I am curious: does A.N. Wilson now, as a theist, give thumbs up to such trivial pursuits as resurrection and ascension? Also, NO there does not seem to be a pattern with Wilson and Flew converting to theism. We would have to see far more atheist conversions to be speaking of a pattern. There is a difference between a fluke and a pattern, just as there is a difference between a fad and a trend. Christian apologists and preachers fail to come to terms with this most important fact: Nothing in the gospels can be trusted. NOTHING. This is because we don’t know their sources—which is a fatal flaw—and they fail the most crucial test: there is no contemporary documentation for anything in the gospels. Here is a good illustration of the importance of contemporary documentation: I recently toured the Museum of the American Revolution in Philadelphia; the exhibits include hundreds of quotes from letters and diaries written by people who lived through the Revolutionary War. THAT’s how authentic accounts of the events are produced. We don’t have anything remotely resembling that for any of the supposed events in the life of Jesus. Another illustration that can be used to drive home this point: If a historian wants to write an accurate account of Lincoln’s day at Gettysburg, 19 November 1863, she would have to find letters and diaries written by the people who were there; she would have to look at newspaper articles written in the days following; she would have to dig through the White House archives to find records about the president’s activities on that day. And even with loads of these kinds of data, there would have to be allowances made for errors and misreporting. We have nothing like this kind of documentation, at all, for Jesus. The gospels were written decades/generations after the “events” they report, hence nothing in them can be trusted, at all. They float free of any grounding whatever, i.e., from the kinds of contemporary documentation that historians MUST have to write history. Hence the gospels qualify only as hagiography/religious fantasy literature that was written, moreover, to win converts. 1. They were divinely inspired. No. That is a theological claim that apologists conveniently insist is unfalsifiable; it is undermined as well when we see the sloppy way that the gospels were constructed. And it really is special pleading to contend that the Christian scriptures were inspired, but—so sorry—not the Qur’an or the Book of Mormon. 2. The gospels are based on reliable oral tradition. No. That is wishful thinking. There is no contemporary documentation to back up that claim. 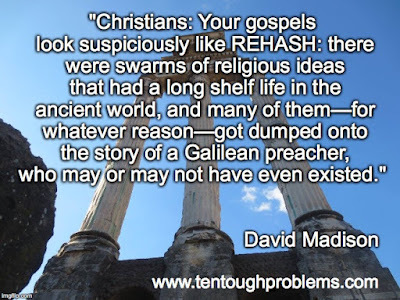 There are so many stories in the gospels, hence the common assumption among New Testament scholars is that these must have been “handed down.” But what is the evidence that they were indeed “handed down” instead of being made up? And what would be the criteria for determining that any particular story has been reliably handed down? 3. They are based on eyewitness accounts. No. Do I need to say it again? There is no contemporary documentation to back up this claim. It is these four realities (especially nos. 2, 3 & 4) that have plunged Jesus studies into such turmoil in the last few decades; even devout NT scholars are deeply divided on what Jesus did and said. So for apologists endlessly to analyze the gospel accounts to glean details about “what actually happened”—well, they are on a fool’s errand. Realist1234 asked me: “What evidence do you have that the early believers and writers of the NT simply made up the resurrection to avoid an 'unhappy ending'?” This is a not-so-clever diversionary tactic, and is precisely the wrong question; it is an attempt to shift the burden of proof (in hopes that uneducated followers won’t catch the error). The disciplined historian knows that documentation has to be provided to demonstrate that a story written decades after the event wasn’t just made up. Say what? “Given that Jesus has a physical/spiritual body…” How in the world can Realist1234 possible know such a thing? “Spiritual body”? There has to be better epistemology than “we can take these resurrection accounts (unverifiable, but so what) at face value.” “Jesus has a physical/spiritual body” is flimflam; it is theological drivel. Theologians typically get away with this kind of scam because they are rarely called to account by the people who trust them to make the faith respectable. I suspect that most of the folks in the pews assume that ‘resurrection’ means that the physical body of Jesus bounced back to life and walked out of the tomb—and invited Doubting Thomas to touch its wounds. But slippery theologians sense the problems with this naïve view, hence we hear: “Oh. It was a spiritual body as well.” Climate scientist Gavin Schmidt has said that his field is plagued by “tsunamis of nonsense.” Well, climate change deniers are amateurs compared with Christian theologians, true specialists at coming up with tsunamis of nonsense. Finally, Realist1234 falls back on that old cliché: just look at the impact of that Galilean peasant, who has triumphed as empires, kings and princes have fallen away. He feels that it’s a shame that “I don’t realize why.” But the facts about the Galilean peasant were lost to history as the early Christian theologians ramped up their theological interpretations of him. The gospels are wagonloads of theology that make the “real” Jesus impossible to figure out; he was obviously lost by the time of The Apostles’ creed: “I believe in Jesus Christ, God's only Son, our Lord, who was conceived by the Holy Spirit, born of the Virgin Mary, suffered under Pontius Pilate, was crucified, died, and was buried…” Everything that the Galilean peasant said and did is missing here, swamped by theology. It would be a good idea for those who swoon at the mention of Jesus and “his impact” to take a look at Philip Jenkins book, Jesus Wars: How Four Patriarchs, Three Queens, and Two Emperors Decided What Christians Would Believe for the Next 1,500 Years. The forging of the Christian faith is not a pretty picture. Jesus didn’t have a tremendous impact on world history because he was such a swell guy (far from it; see Hector Avalos, The Bad Jesus), but because the church and its inflated theology came out on top in the power struggle.